The Liberia Football Association (LFA) Topflight championship chase continued Thursday in Group A with Invincible Eleven (IE) grabbing a retribution win over ‘Church Boys” Jubilee FC, while Barrack Young Controller (BYC) stormed Monrovia Club Breweries at the Antoinette Tubman Stadium (ATS) and Nimba United held hostsWatanga at the Nancy B Doe Sports pitch in Kakata, Margibi County. IE came from one goal down to grip a 2-1 revenged victory over Jubilee FC who whipped them 4-0 in phase one of the LFA First Division League. Goals from fearful winger SholeeQuaih and midfielder BlamoWeah sealed the win for the Sunshine Yellow Boys. IE kickoff on a flying note with SholeeQuaih who is now the local league most dangerous player creating a glorious –chance, but BlamoWeah 23-yard shot deflected on the cross bar for a Jubilee goal kick. Jubilee took the lead 18 minutes into the paring, thanks to KamanueFolee gambling strike. The goal raised IE from their slumber with star player SholeeQuaih tearing down the Jubilee defense on several occasions, but poor striking ability of Cyrus Jackson starved them of a chance to redeem. Quaih had to match to the goal himself wreaking the Jubilee defense to score a mind-boggling goal that saw the die-hard IE supporters at the stadium arousing from the seats. Coach Papa Kamara had to bring on ball-distributor Wellington Seah and striker Morris Sando to take hold of the match and the pair coordinated well with Sholee, thus dismantling the organize Jubilee midfield . Sholee again engineered the winner setting up BlomoWeah who also relied on slothful defending by Alphonso Doyen and Sam Smith to walk through goal. The result lifts IE from the bottom of the table and took them to seven points on tie with Jubilee. Earlier Barrack Young Controller (BYC) outnumbered Monrovia Club Breweries (MCB) 2-0 to move leveled on points with Watanga FC who was held to 1-1 draw by Nimba United. Junior Barshall’s terrific strike and LarmineJabateh’sstretchy goal in the second half gave the defending champions a deserving win. Both sides failed to prove their quality in the first half as goalkeepers Nathaniel Sherman and AbdulaiKoulibaly were on holiday. 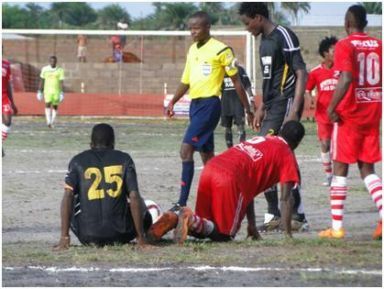 Nimba United and Watanga FC failed to move up the table as both sides played to another draw. The last three matches between the two teams have ended in a draw.